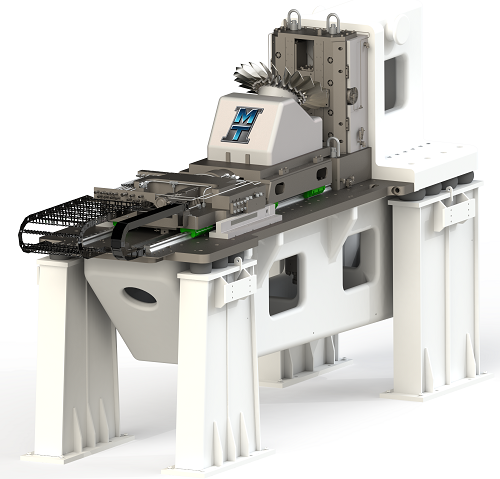 Manufacturing Technology, Inc. (MTI) has shipped North America’s first linear friction welder capable of full sized part development to the LIFT – Lightweight Innovations for Tomorrow - in Detroit where it will contribute to cutting edge lightweighting research in the automotive and aerospace sectors. Measuring 22’ x 8 x 14’ and weighing 122,000 pounds (61 metric tons) – roughly the same weight as a Boeing 737 – the LF35-75 has the largest tooling envelope of any linear friction welder in the world, allowing for the production of the largest full-scale parts available. It will bring the same linear friction welding technology used in aerospace to achieve light-weighting blisks and Integrally Bladed Rotars (IBR) to aircraft engines and the automotive industry. LIFT, one of the founding members of Manufacturing USA, is a public-private partnership designed to help develop and deploy advanced lightweight metal manufacturing technologies and implement education and training programs to better prepare the workforce of today and tomorrow. LIFT expects the welder to be utilized immediately upon its set up in Detroit by its members to complete their ongoing research and development projects.